Need storage and want style too? The Damon Wall Unit checks both those boxes. The beautiful solid reclaimed wood adds a natural texture to a room, and the multiple cubbies provide ample space for storage and display. 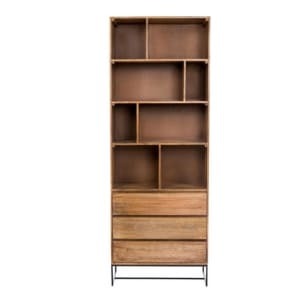 Each six shelf vertical bookcase comes in two parts for easy transport. Use just one column or group several together. 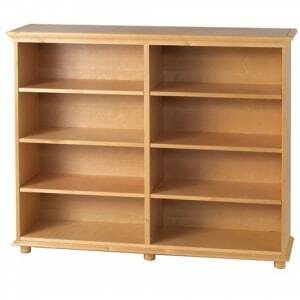 The alternating sizes of the cubbies in the Colvin Bookcase make it visually appealing while still being functional. Below the shelves are three drawers which keep clutter hidden. A sleek metal base adds a nice contrast to the warm finish of the solid mango wood. Group with other pieces from the Colvin collection for a cohesive look. Need lots of storage space? The Huge8 bookcase lives up to its name! With six adjustable/removable shelves and two fixed bottom shelves, the Huge8 offers a total of 8 shelves for storage. Fill with books and knick-knacks or add baskets to have some enclosed storage. Three colors are offered to best suit your decor. 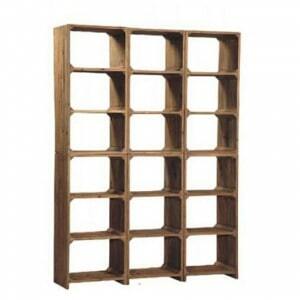 The Huge8 bookcase features a removable crown moulding top and base should you want to change the look down the road. The School chair will hopefully make doing homework more fun (if possible). Each chair is height adjustable and spring rocking mechanism. Choose from the many fun colors. The Bungie office chair is functional and fun. 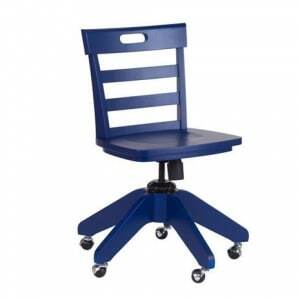 The functionality comes from the sturdy five wheels, powder epoxy coated steel frame, and gas-lift adjustable height. The fun comes from the strong bungie cord loops that form the seat and back, which are offered in a variety of colors. 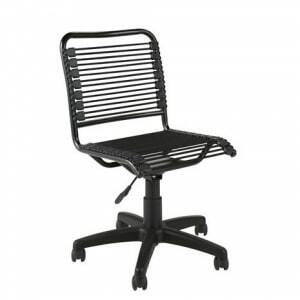 The low back style has no arms while the Bungie High Back chair features soft armrests. 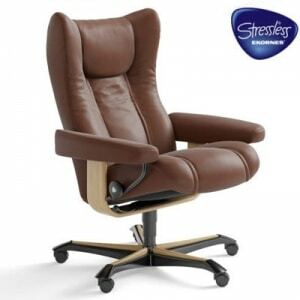 Have a comfortable day at work in the Stressless® Wing office chair. 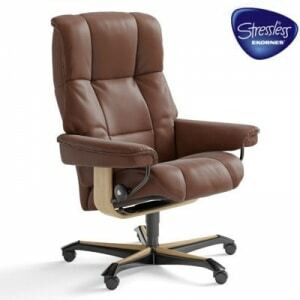 It has all the features of the traditional Stressless Wing but with an office-friendly wheeled base. The Plus™ system adjusts the lumbar support along with the headrest to give you perfect support in any position. The Stressless® Glide wheels lets you adjust to the most comfortable position simply by using your body weight, and Comfort Zones™ give you the best seating comfort in any position. Many fabrics and top grain leathers are offered. Want a Stressless work day? Try the Stressless Sunrise Medium office chair. 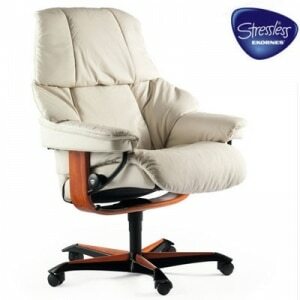 It has all the comforts of the traditional Stressless Sunrise Medium chair plus a sturdy wheeled base. The Plus™ system adjusts the lumbar support along with the headrest to give you perfect support in any position. The Stressless® Glide wheels lets you adjust to the most comfortable position simply by using your body weight, and Comfort Zones™ give you the best seating comfort in any position. Lots of beautiful fabrics and top grain leather from which to choose. 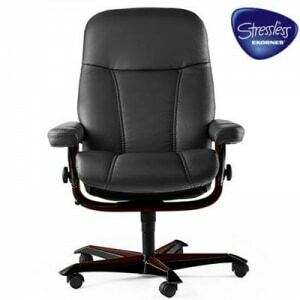 The traditional Stressless® Reno upgraded for office functionality with a sturdy wheeled base. The Plus™ system adjusts the lumbar support along with the headrest to give you perfect support in any position. The Stressless® Glide wheels lets you adjust to the most comfortable position simply by using your body weight, and Comfort Zones™ give you the best seating comfort in any position. Choose from a wide array of beautiful fabrics and top grain leathers. 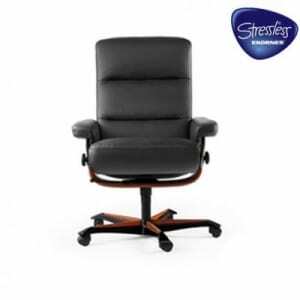 Looking to work in the comfort of a Stressless chair? Now you can! The Stressless® Mayfair Office chair has all the features of the standard Stressless chair, yet on an office-functional castered base. The Plus™ system adjusts the lumbar support along with the headrest to give you perfect support in any position. The Stressless® Glide wheels lets you adjust to the most comfortable position simply by using your body weight, and the Comfort Zones™ give you the best seating comfort in any position. Choose from a wide selection of beautiful fabrics and top grain leathers. The Stressless Magic Medium Office chair is a Stressless chair taken to the next level - they've added office functionality with a sturdy castered base! The Plus™ system adjusts the lumbar support along with the headrest to give you perfect support in any position. The Stressless® Glide wheels lets you adjust to the most comfortable position simply by using your body weight, and the Comfort Zones™ give you the best seating comfort in any position. Choose from a wide array of beautiful fabrics and top grain leathers. 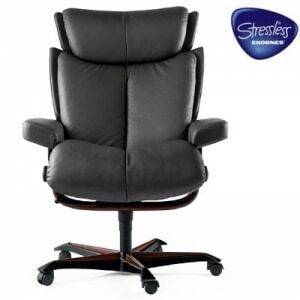 The Stressless® Consul Office chair has all the features of the standard Stressless Consul chair, yet on a castered base for office functionality. The Plus™ system adjusts the lumbar support along with the headrest to give you perfect support in any position, and the Stressless® Glide wheels lets you adjust to the most comfortable position simply by using your body weight. Comfort Zones™ give you the best seating comfort in any position. Many beautiful fabrics and top grain leathers are offered. 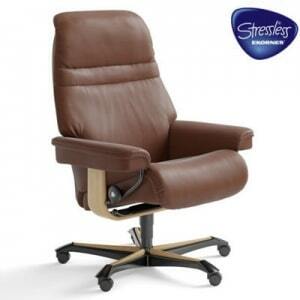 Work in comfort in the Stressless Atlantic Office Chair. The Plus™ system adjusts the lumbar support along with the headrest to give you perfect support in any position. The Stressless® Glide wheels let’s you adjust to the most comfortable position simply by using your body weight, and the Comfort Zones™ give you the best seating comfort. Choose from a wide range of leathers and fabrics to best suit your style.